In September of 2011 an Anti-Bullying Week was established during the first month of school. Our third annual Anti-Bullying Week is being celebrated from September 16-20, 2013. Having an anti-bullying week early in the school year has helped send a strong message and set a positive tone for the rest of the year on our district campuses. Downey Unified has packaged and promoted our anti-bullying efforts under the umbrella of CHARACTER COUNTS! The goal is to work on Creating a Culture of Caring that does not allow for bullies and their behaviors to thrive. Several months ago during the spring of 2013, members of the G.O.O.D. 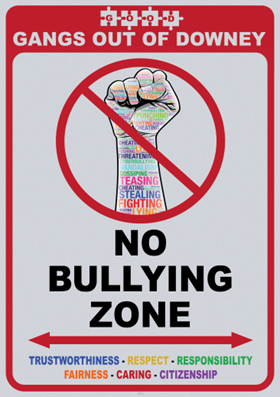 committee saw an opportunity to collaborate with the school district to send out a strong, community-wide message against bullying and the “No Bullying Zone” poster along with a packet entitled Bullying Prevention Discussion/Lesson Plan Ideas were the result. With funding provided by G.O.O.D., over 500 K -8 classrooms across Downey Unified received a poster (see below) along with the discussion/lesson idea packet. Additionally, these posters were provided to City of Downey’s Department of Parks and Recreation, the after-school ASPIRE program, the YMCA, and various other community organizations. The goal of the poster and packet is to further educate children in grades K-5 and middle school about bullying, and to raise their awareness about the negative impact of these behaviors throughout our schools and community.